There have been a few times that I have craved this dish, but I couldn’t remember the name or where to find the recipe. Well just my luck I had accidently bought some leeks by mistake and went looking for a recipe in my new recipe spreadsheet that was using leeks. 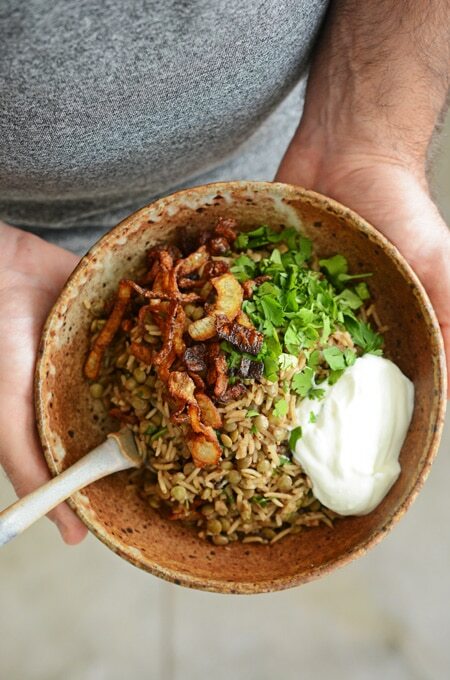 And what do you know; I found a recipe using leeks in my Cook’s Illustrated magazine the same magazine that had this recipe for Rice and Lentils with Crispy Onions! I was so excited I had to put this on the meal plan and blog it ASAP! I hope you will enjoy this one as much as I do. Toss the onions and salt together in a large microwaveable bowl. Microwave for 5 minutes and rinse thoroughly. Transfer to a paper towel-lined baking sheet and dry well. Heat onions and oil in a Dutch oven over high heat, stirring frequently, until onions are golden brown, 25-30 minutes. Drain onions in a colander set over a large bowl. Transfer onions to a paper towel-lined baking sheet to drain and set aside. Reserve 3 tablespoons of the onion oil for the dish and save the remaining oil for another purpose. Oil can be stored in the refrigerator for up to 4 weeks. 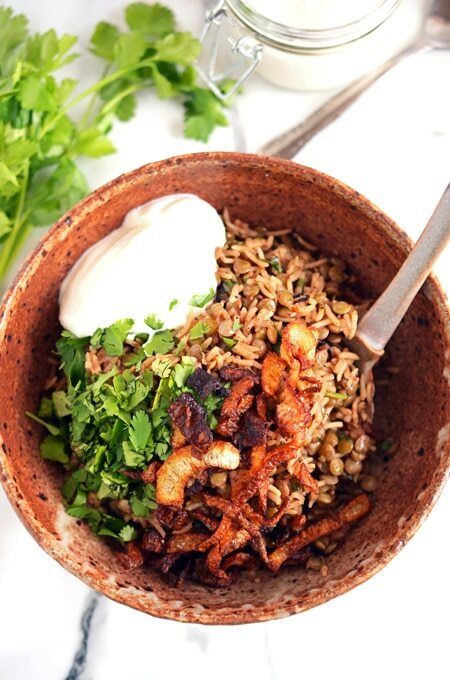 Whisk all the ingredients together in a bowl and store in the refrigerator while you prepare the rice and lentils. Combine lentils, 4 cups of water and 1 teaspoon of kosher salt in a medium saucepan and bring to a boil over high heat. Reduce the heat to low and cook the lentils until they are tender, about 15 to 20 minutes. Drain and set aside. 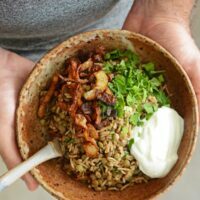 While lentils cook, place rice in a medium bowl and cover by 2 inches with hot tap water, and let stand for 15 minutes. Using your hands,gently swish around the rice to release excess starch. Carefully pour the water off leaving the rice in the bowl. Add cold tap water to the rice and pour off the water. Repeat this process 4 to 5 times until water runs almost clear. Drain rice in a fine mesh strainer. Heat reserved onion oil, garlic, coriander, cumin, cinnamon, allspice, black pepper and cayenne in a Dutch oven over medium high heat until fragrant, about 2 minutes. Add rice and cook, stirring occasionally, until the edges begin to turn translucent, about 3 minutes. Add 2 ¼ cups water, sugar and 1 teaspoon salt and bring to a boil. Stir in the lentils and reduce the heat to low and cover. Cook until all liquid is absorbed, about 12 minutes. Turn off the heat and remove the lid. Fold a dish towel in half and place over the pot, replace the lid and let stand for 10 minutes. 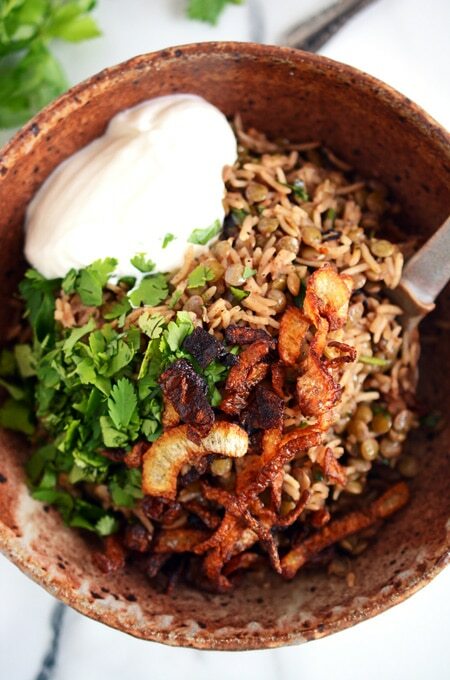 Fluff the rice and lentils with a fork and stir in cilantro and half of the crispy onions. Transfer to plates and top with remaining crispy onions and yogurt sauce.